To help you jump start your goals for 2018, I am sharing another free 7-day flexible meal plan including breakfast, lunch and dinner for the entire week as well as a shopping list! This is just a guide, you should aim for around 1500 calories* a day. I’ve left plenty of wiggle room for you to add more food such as coffee, beverages, fruits, snacks, dessert, wine, etc. *This is just a guide, women should aim for around 1500 calories pound per week. Here’s a helpful calculator to estimate your calorie needs. I’ve left plenty of wiggle room for you to add more food such as coffee, beverages, fruits, snacks, dessert, wine, etc. This is my first week doing this and I LOVE it!!! You have made it so easy to eat healthy, and also made it easy for a family. This even fills my hungry and picky boys. Thank you. Please keep doing this!!!! Gina, I have been following your recipes for years. I have both of your cookbooks and love them so much they’re my go-to gifts for friends and family. We have a common phrase in my house “skinnytaste never fails” because each recipe seems to outdo the one before. I LOVE these new meal plans that include all 3 meals and the shopping lists. I will definitely be using them! I am using your meal plain, thanks for doing this. I understand this,well done. I hope you continue this. Love, work is done! No guessing or counting you have done it all!! Love, love! FYI I got the newly updated meal tracker from amazon and there is a MISTAKE.. after the 2nd week of the weekly meal planner (34-35) page 36 and 37 are calorie/point trackers for Friday-Sunday, then 38 and 39 are Monday-Thursday. Same thing happens for pages 40-45. Then it seems to be okay the next few ones. Thank you Kate, they are reprinting them because of the error. If you want to replace the book please email me! Your website is amazing! Thank you so much for all your hard work and posting these amazing recipes and guides! I just started my journey 4 days ago and this is going to help me tremendously! I HAVE FOLLOWED YOU FOR QUITE SOMETIME NOW! YOUR RECEIPES ARE AMAZING, SO TASTEFUL AND EASY TO MAKE! THESE NEW MEAL PLANS ARE INSPIRING, FOR PEOPLE ON A BUDGET THESE MEAL PLANS MAKE SENSE AND ITS ALL LAID OUT! PLEASE KEEP IT GOING. i AM SURE THERE ARE A LOT OF PEOPLE WHO NOT ONLY ENJOY BUT APPRECIATE ALL THAT YOU DO!! KEEP UP THE GREAT WORK, YOU ARE TRULY INSPIRING!! This is so awesome! Thanks for putting this together. Please please keep doing these! Thanks Gina!! Awesome week of meals, even the hubby loved them. Please continue sharing, they are a huge help to keep eating healthy all week. This is going great!!! I love all the recipes ( except the banana pancakes are not for me) thanks so much for doing this!! This is such an amazing resource. Thank you for putting it together! So far this week I have made the mini egg omelettes, fiesta bean salad, and turkey taco chili. Everything was amazing! And I grocery shopped using your list, so I have ingredients on hand to make the rest of the meal plan next week. Thank you, thank you again for developing this! So exciting to have a hand-picked selection of skinny taste recipes organized and at my fingertips like this. I’ve been using this meal plan for a couple days and have already lost two and a half pounds!! Thank you for all you do! Please keep doing these menus! I use them as inspiration on a regular basis. I find the lunch suggestions particularly helpful! Thank you for this.!! !I am a little bummed that I am currently pregnant and can’t use this meal plan but I will be referring to it the minute this baby is out; to help lose the baby weight. You website is literally the only reason I stuck to Weight Watchers the last time and I lost my baby weight. I will be sending photos this next time as a testimony to your website. Your website is amazing!!!!! Thank you for the meal plan!! I’ve loved every one of your recipes I’ve tried so far!!!! 🙂 I’m especially grateful for the Instant Pot friendly ones!! absolutely loved this! used all the recipes! Great concept! THANK YOU!!!! Thank you so much for this amazing meal plan! I’ve got the turkey chili simmering now, and I made the Salisbury Steak Meatballs and they were amazing! They might be one of my new favorites from you. Love every recipe I’ve tried of yours. Thank you! This is the first week in years I’ve made a meal plan. I also took lunch to work twice this week – and that is almost unheard of! Your weekly plan made it so easy! Thank you! You’re a genius! I don’t know what I would do without your meal plans. They truly keep my family on track with healthy eating. It’s so easy to fall into the pattern of eating out all the time and not really paying attention to what you’re putting into your body…your meal plans help us avoid that so please, please, please keep sharing them with us. I just received your meal planner for Christmas and am loving it. Thank you for sharing and helping us all stay healthy and on track. Thank you, Thank you, Thank you!!!! Thank you for the meal plans. I made the broccoli egg breakfast and my husband has been eating them all week. I also made the Cauliflower soup (which was amazing) and the mediterranean salad last night. I would have never thought to pair those together and probably served another lettuce salad. It was a great combination. Love your recipes! I do use these, just not in their entirety.. For this week, I made the taco chili soup (which I am one person so I have literally eaten it everyday this week), the tomato tuna salad (4 times!! ), the banana pancakes and I want to make the quinoa bowl for Saturday breakfast. I also make eggs, but I can’t bring myself to try the muffins, I’m not a big fan of quiche so I just can’t do it… so instead I made eggs with ham spinach cheese hot sauce and onion. I’m also gonna see alt that salmon dish… If I can find salmon at a reasonable price (if I can get out of my driveway anyone anyway….darn snow!!) I’m trying to eat healthy… You’re helping me. Thank you! Oh! I made that chicken parm to… Although I didn’t bread it and I did it on the stovetop. I’m still counting it though! Gina, THANK YOU so much for putting this together! This is exactly what I need – to keep myself on track all week PLUS feed my family dinner each night without making separate meals!! I cannot love this more! Please continue! I discovered you a year ago on facebook and got your two cookbooks last year for Christmas. Love, love, love everything I’ve made. Even my picky kids enjoy your recipes. So now they know they can trust your recipes… so if I introduce something new, all I have to say is, “It’s Skinnytaste” and they don’t balk. Now, I am in LOVE with your weekly meal plan. You really pack a great variety of tastes, while minimizing the workload. Thank you for doing this, and I hope you keep it up! I LOVE your plan! Thank you for taking the time to share. It’s so helpful when planning my own meals. Keep on sharing please! Please keep making these meal plans…I haven’t tried it yet, but I am definitely going to start within the next month…I have this one all printed off so I can use it when I start! Eating healthy is so much easier when someone else has done the leg work for you…especially when you are a busy mom of 3 that works full time like I am! I may have to tweak or sub a different meal here or there for supper if I don’t think my family will like it, but this definitely gives me somewhere to start! This is so wonderful, please keep posting weekly menus as I am following your meal plans. I love those omelettes, and just to add a little flair I wrapped them in a piece of bacon. Delicious and low-carb. I am new to your site and anxious to try your recipes as well as your meal plans. You give the smart points for the recipes. Are they the same as the new free style points or would the the free style points be different? I’ve always loved all your recipes and have followed you for close to 8 years now. I also recommend your site and books to all my friends and family. Because of your recipes, my husband and I were able to lose over 80 pounds combined. I love that you make these lists and meal plans for every week of the year. They’re so helpful! Love the meal plan! Your recipes are so yummy. I’m using for the first time! So far so good. I’m not doing all of the recipes so the grocery list isn’t helpful for me. I’ve been using your meal plans (breakfast, lunch, dinner) since you started them and they are incredible! I use your cookbook or my own recipes for dinner the rest of the days of the week. Please continue to do this breakfast, lunch, and dinner plan! This is awesome! Thanks very much for doing this. My daughter and I wanted to get the year off to a healthy start, and this has been a big help! Thank you so much!!! This is just what i needed to get off to a good start. I’m a single mom with 5 Little’s and finding healthy ways to feed them seems impossible sometimes. I can’t wait to try all of these!!! This is exactly what I have been looking for! Straight forward, healthy, achievable, customizable, delicious. What a fantastic kick start to 2018. You have a new fan. I struggle with getting creative and healthy meals, especially breakfast and lunch. You are the answer to a busy family’s prayers. Thank you! Thank you! Thank you! I have two kids and a husband who are picky eaters. Many times the kids are too afraid to try anything new and the husband is complaining about my food lacking “sazón” or seasoning. I have bought both cookbooks and your new planner because I have NEVER recieved a complaint from the kids or the husband when I’ve made your recipes! I cannot thank you enough! You have made my life so much easier since meals are usually very stressful for me. Not anymore! That means the world to me! Thanks for spending so much time creating these weekly meal plans. I’ve taken advantage of them for the last few months. They’ve been so helpful, especially as I’m hellbent on losing these last 20#. Please keep the plans coming! Please keep doing these!! They are awesome and really help me with planning my lunches which are some of my most difficult meals to plan. Thank you so much for all your hard work!! I appreciate the wonderful recipes. I use your meal plans and they are so helpful! The shopping list is also a great help, thank you for your hard work and dedication . Thanks for sharing these weekly meal plans and grocery list! Love using them ?? I love, love your site. I have used your dinner plans all year as an interagal part of my weight watchers journey–35 pounds later, whenever people ask how I did it, I credit the Instagram weight watchers community and YOU! I like the inclusion of the breakfast and lunches this week. It was a great jump start to the year! This looks awesome, but I’m wondering about cost? I have a tight food budget. I know it’s differnt costs in different parts of the country, but would you have an estimate or range of the cost of this food? That is my biggest hurdle to. I didn’t make all the record for that reason. I doubled the taco soup and ate that over the spaghetti squash. I only made the recipes I knew I’d eat. Do you know how AMAZING this is!?? THANK YOU. Your recipes are always a hit with my picky family. Your recipes keep me on track with Weight Watchers. This is exactly what I need to kick off my year. Thank you! This is fabulous!!! YES!!! Please continue to include a grocery list with the weekly plans. I love your meal plans. They are very family friendly, easy to use and delicious. I find when I follow your recommendations and recipes, I am much more organized, calm, and prepared. Plus everyone in the house knows what we are eating, so it works out great! Thank you!! please definitely continue to include the shopping lists. Extremely helpful!! Thank you! I love your meal planning posts and use them! They are very helpful. – so please keep posting them! 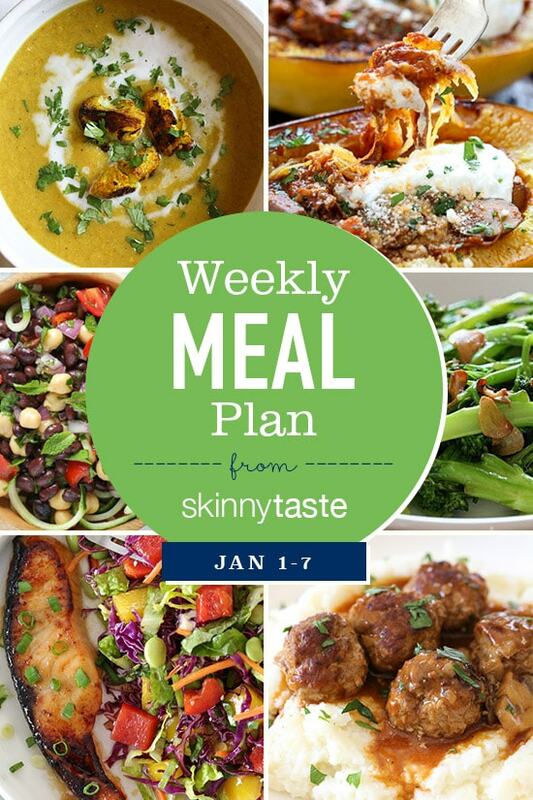 I also have bought the skinnytaste meal planner. I love the new spiral binding on it! Love your meal plans! Please continue to share them!! Sorry, I’m confused, are the points in parentheses the freestyle points? They all say smart points still. OMG! I love that you did a full day! I live a very busy life and love your meal plans. What a great way to start the year!! I love your plans! They are healthy, delicious, and affordable! Please keep making them! These are awesome and so helpful. I’ve been visiting your site for years and now I’m just starting to try to lose my remaining postpartum weight- my son is 7 weeks old, so getting organized is extremely difficult. These are a lifesaver! I plan to get the new meal planner as well. THANK YOU!!!! Love the meal planning – you’re helping me get healthy with portion control and adding more veggies to my family’s diet!!!! Thank you for the detailed shopping list – it is immensely helpful! This is very helpful. Thank you for providing this. I love this! Thank you for doing it and please continue. I’m just getting ready to start WW and this will be so helpful. Every one of your recipes I have tried are totally delicious. We are huge fans! I love the Meal Plan. I plan on using your Meal Plans to help me plan and organize for the week. Thanks so much! I love the Dinner Plan but when you started the Meal Plan, I was so happy! It is just me but I can scale. It takes the headache out of planning but allows me to try new recipes. Please continue to do the total day Meal plan. Thank you! Yes, please keep doing the menu and the shopping list!! Me & my mom love your recipes and this has made meal prepping a breeze. We appreciate all the handwork you put into it. This is amazing., please continue it. Yours is the only site I truly love!Your graphics are clean and modern and your recipes clear, concise and delicious!Thank you so much! Please keep them coming! Thank you for taking the time to lay all of this out. It makes shopping and healthy cooking much easier! This is seriously AMAZING! Please keep them coming. I look forward to getting your meal plans every week, they make it so easy for me to follow a meal plan I can stick to. I also purchased your meal planner, and just wrote down my first week! Looking forward to having it keep me on track this next year. Thanks for all that you do! I’m loving the way you have this laid out! Can’t wait to get cooking tomorrow! I’m using these!! Def keep posting them. Thank you! Yes please!! Love the meal plans! So helpful and really appreciate you not charging extra to get them! Such a help:) thanks! Love everything you make!! Sorry if I missed it, but are you planning to update older recipes to WW Freestyle? It seems like the Turkey Chili Taco Soup should be 0 SP on the new freestyle. Am I wrong? It would be amazing if it was 0 points? What am I missing that has points? I love, love, love that you are doing this! Thank you so very much! I love this! Please continue. It helps me so much. Yes Please keep doing your weekly menus and grocery lists. Thank you for taking the time to do the weekly planning. I’m even trying a few new foods. i’ll be going to get your planner. Please continue to share the menu plans/shopping lists! I have used them regularly this fall and have lost 20 pounds — since Aug. 30. I’ve used your recipes for several years, but the menu plans have made all the difference! Thank you, thank you, thank you! Thank you so much for these meal plans! I love that they are filled with delicious recipes from your blog that I haven’t even seen yet and that they include breakfast and lunch. So nice to be able to see which recipes work to make one day and eat for a couple. Thank you again! I read your blog all the time, but I never realized that you include grocery shopping lists with your meal plans!!!! How did I not know this? You’ve made my year so far. Planning to give this week a try. This is perfect for y family. Thank you. Thank you so much for doing this!! I enjoy all your recipes and appreciate you taking the time to put this on your website!! I will definitely be using this!! Love using your meal plans. I tend to mix up the meal plans, since I am cooking for 1. This week I will batch cook the turkey chili,, and use that for several meals and try the fiesta salad, but skip on some of the others and try them next week! Takes out so much of the guess work! Thank you! Thank you! This is just what I needed to get organized, I did the shopping this morning for the week and prepped the mini muffins. This menu is so family friendly!! I am loving these new meal plans. Thank you for this wonderful resource. My goal for 2018 is to get my family eating better together. I saw your article in the Cooking Light Magazine. Good job! This is awesome!!! Thank you, Thank you, Thank you, for taking the time and energy to organized all this. I have gotten so busy with teenage kids and their schedules I have lost my healthy cooking ways. This is just what I need to get my but in gear!!!! I had your first cookbook and loved many meals in it! I got your slow and fast cookbook for Christmas and am excited to start making new recipes. Having it laid out is an incredible guide and helps to make a stressful task of meal plannng much less overwhelming! Thank you for doing the hard work! I hope you continue to share!